THIS Christmas Eve, Corus Hotel’s Dondang Sayang coffee house is offering a wide-ranging buffet, from tried-and-true traditional main dishes to several must-have festive sweets and desserts. Headed by sous chef Lee Weng Loong, you have the mainstays such as turkey and beef, along with one or two interesting seafood-based dishes whipped up by the coffee house’s kitchen. The centrepiece of the buffet setting is, of course, the turkey. Served with buttered vegetables (carrots, celery, mushrooms!) and infused with a healthy dose of herbs and spices, Dondang Sayang’s turkey is slow-roasted for about 30 minutes (depending on size) at around 200 degrees Celsius. For added sinfulness, mix the mashed turkey giblets and oven drippings with some roux (butter and flour cooked together) and more seasoning (including a little paprika and oregano) for a savoury dip. Instead of the usual cranberry sauce, Lee has added some orange zest to round off the jam’s sweetness with a tart note, making each bite of turkey slice with the jam a treat for diners. Then you have the Herb Marinated Roast Beef, which Lee specifies is the sirloin cut, and marinaded a day before for total infusion. “We use paprika, oregano and thyme for the marinade. During the cooking process, we braise the whole sirloin and then slice the meat into fillets and simmer a little further with black pepper sauce,” said Lee. One gets a tender, chewy result, cooked enough but with a pink centre. If you like, dip it in the cranberry sauce for a totally different flavour, marrying the zesty jam with the spiced beef. A must-try (in this writer’s opinion) is Lee’s own lamb stew. Made from tomato paste and some puree, mirepoix (a mix of carrots, onions and celery for added taste), Lee also includes some chillies for visual effect and a little piquancy to the stew. The end result is chunks of tender lamb infused with tomato and the combined flavours of the mirepoix, topped off with rosemary garnishing and bay leaf. Moving on to fish, salmon is a must-try, and get it while it’s warm. While salmon is usually grilled or cooked with crispy skin, the kitchen has cooked it as such that the skin is still soft with a buttery texture. One gets a wonderful combo of firm salmon flesh contrasted with the soft, melting skin, flavoured with teriyaki sauce and garnished with fried shallots. Also, do try the baked seabass with caper-garnished cream sauce, where the firm, if a little bland fish, provides a nice backdrop for the tartness of the capers. Aside from the above, you have a host of delicious desserts, ranging from delightful little quince-filled mincepies, along with Christmas cheesecake, traditional Christmas fruit cake and crowd-favourite Yule log cakes. 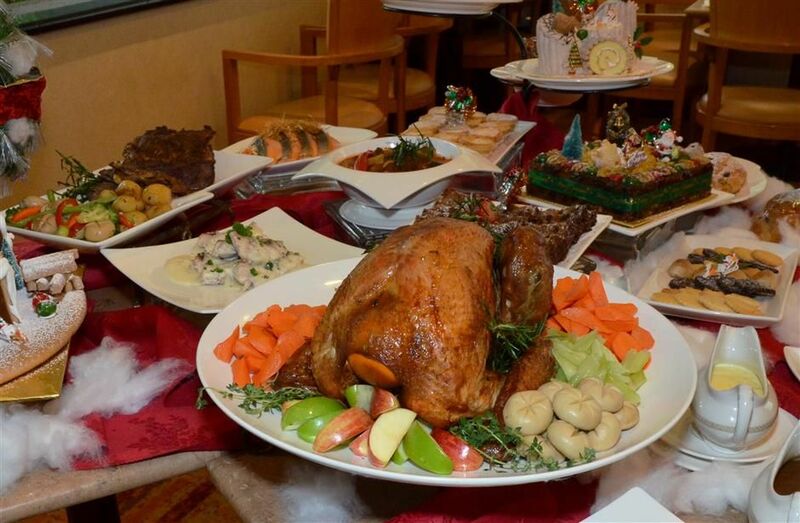 The Christmas Eve buffet, which costs RM98++ (adults) and RM49++ (children), starts at 7pm. The hotel will donate RM2 for each sale made to the Lighthouse Children Welfare Home Association Kuala Lumpur and Selangor, for the childrens’ living expenses. This is the writer’s personal obersavation and is not an endorsement by StarMetro.